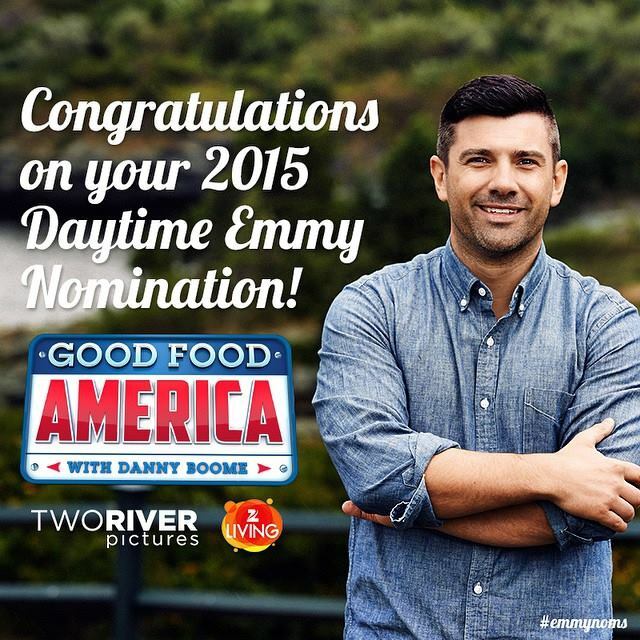 Two River Pictures is thrilled to announce that Good Food America host Danny Boome has been nominated for a 2015 Daytime Emmy in the category of “Outstanding Culinary Host”! The nomination is a well deserved acknowledgement of all of the hard work, professionalism, skill and charm that Danny brings to every episode of Good Food America. Good Food America is a culinary adventure that takes you on a cross country tour showcasing America’s farm-to-table movement! New host, Danny Boome (Chef and one-time host of Food Network’s Rescue Chef and ABC’s Recipe Rehab), will be taking you to 15 cities, from vegan cafes and locavore bistros to truck stops and cantinas, to find the freshest ingredients and healthiest dishes cooking in the kitchens’ of America’s most innovative restaurants. Tune into Good Food America each week as Danny drops in on chefs across the country and highlights the healthiest fare on their menu, and what they are doing to make it taste so good. Season 1 of Good Food America, hosted by Chef Nathan Lyon, focused on the local farms providing fresh and natural ingredients. Lyon was nominated for an Emmy for “Outstanding Culinary Host.” This season, prepare to be inspired — and hungry — as you go touring Good Food America!